Chapter I. Normandy. A.D. 870-912 The Norman Conquest.Claim of William to the throne.The right of the strongest. One of those great events in English history, which occur at distant intervals, and form, respectively, a sort of bound or landmark, to which all other events, preceding or following them for centuries, are referred, is what is called the Norman Conquest. 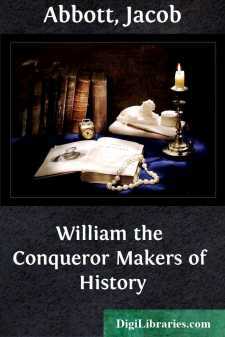 The Norman Conquest was, in fact, the accession of William, duke of Normandy, to the English throne. This accession was not altogether a matter of military force, for William claimed a right to the throne, which, if not altogether perfect, was, as he maintained, at any rate superior to that of the prince against whom he contended. The rightfulness of his claim was, however, a matter of little consequence, except so far as the moral influence of it aided him in gaining possession. The right to rule was, in those days, rather more openly and nakedly, though not much more really, than it is now, the right of the strongest. Map of England and part of France, showing the situation of Normandy. The English Channel.Nature of the French coast.Nature of the English coast. It lies, as will be seen upon the map, on the coast of France, adjoining the English Channel. The Channel is here irregular in form, but may be, perhaps, on the average, one hundred miles wide. The line of coast on the southern side of the Channel, which forms, of course, the northern border of Normandy, is a range of cliffs, which are almost perpendicular toward the sea, and which frown forbiddingly upon every ship that sails along the shore. Here and there, it is true, a river opens a passage for itself among these cliffs from the interior, and these river mouths would form harbors into which ships might enter from the offing, were it not that the northwestern winds prevail so generally, and drive such a continual swell of rolling surges in upon the shore, that they choke up all these estuary openings, as well as every natural indentation of the land, with shoals and bars of sand and shingle. The reverse is the case with the northern, or English shore of this famous channel. There the harbors formed by the mouths of the rivers, or by the sinuosities of the shore, are open and accessible, and at the same time sheltered from the winds and the sea. Thus, while the northern or English shore has been, for many centuries, all the time enticing the seaman in and out over the calm, deep, and sheltered waters which there penetrate the land, the southern side has been an almost impassable barrier, consisting of a long line of frowning cliffs, with every opening through it choked with shoals and sand-banks, and guarded by the rolling and tumbling of surges which scarcely ever rest. Northmen and Danes.Character of the Northmen.Their descendants.